So you want to be a life scientist? 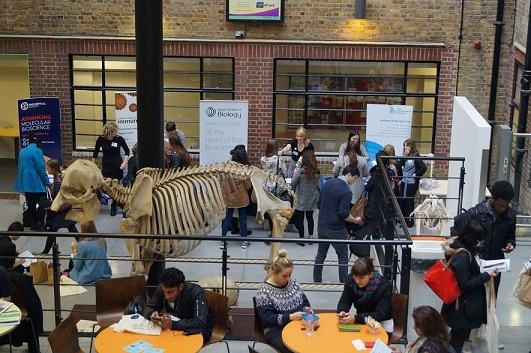 An impressive elephant skeleton took centre stage in the middle of the Life Science Careers Conference, surrounded by exhibitors representing careers in all avenues of biology, from teaching, to research, to conservation to science communication and more. 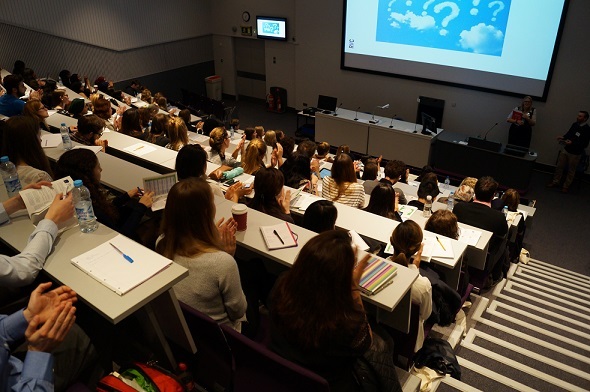 The atmosphere at the Royal Veterinary College was that of hustle and bustle with students flooding in, having travelled from all over the UK to find out more about life science careers. The day included a series of interesting lectures, delivered by professionals working in diverse fields of biology. Brief presentations were followed by lots of time for questions and answers, to provide students with real insights into what potential career paths entail – opening their eyes to the seemingly endless possibilities. A CV workshop provided practical tips on how students should best secure an interview and mock interviews throughout the afternoon gave students an opportunity to practise for what are often experiences laced with trepidation. The RSB stand was swarmed with budding biologists. We gave out career guides and answered student questions, directing them to relevant stands and talks. As an intern yet to decide on a career path of my own, I shared many of the undergrads sentiments – at the tender age of twenty-something, how should we know what we want to do with the rest of our lives? I ensured that no student left without an ‘I <3 Biology’ sticker and enjoyed some wonderful conversations with a number of students; sharing our experiences and aspirations. The majority of students felt unsure about the direction they wished to take their career; often hesitant about whether they wanted to be in or out the lab and uncertain about pursuing further study. The majority of students reported a positive experience and came away from the conference with more than just heavy careers guides and of course plenty of free pens! They also heard from many experts in their fields, made useful contacts and interacted with a spectrum of organisations in the life science landscape. I got the impression that many students left with a renewed confidence in their future. Maybe they still did not know what they wanted to be, but at least they knew their options and were armed with all the necessary tools to succeed. I know from my studies and work experience that I’m neither destined for a life in the lab (it would seem I am quite the health hazard, pipetting E. coli all over my lab partner…) or as a veterinarian (I cried in the bathroom every time an animal died at the surgery). So the main advice I can offer is to give anything you find interesting a go, and if it doesn’t work out, then at least you’ve crossed one thing off of a long list of possibilities. Doing something to help you move forward is always better than doing nothing and waiting for inspiration to strike. Find out more about the Life Sciences Careers Conference if you are interested in attending or hosting an exhibit next year and check out our career resources, including spotlights on a huge breadth of research careers. The LSCC is organised by the Royal Society of Biology in association with: Biochemical Society, British Ecological Society, British Pharmacological Society, British Society for Immunology, Society for Endocrinology, Society for Experimental Biology, Microbiology Society and The Physiological Society. Comments Off on So you want to be a life scientist?